Rob Jefferis is a seasoned expert when it comes to growing. Growing avocado was not Rob’s first rodeo as he grows kiwifruit, manages cattle and cares for the blooming avocado orchard. In fact, Rob has 60 acres dedicated to growing his fresh produce and his cattle. Rob is a great fan of the taste and versatility of avocados, which in his eyes surpasses that of any other fruit. He has been an avocado grower for over 19 years. 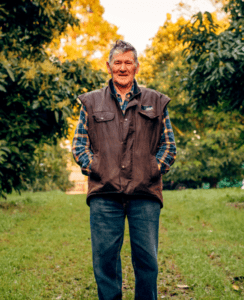 It was back in 1998 when Rob planted his very first avocado tree and he remains hands-on with managing the orchard today. This year, Rob hosted a grower education event at his orchard so that growers could share knowledge about growing great avocados with care. Growers and avocado scientists shared their insights around planting, pruning, and tree nutrition to produce more of their best avocados. Growers are continually improving their on-orchard practises, utilising innovation to improve quality, taste and productivity. Avocado growers enjoy each other’s company and sharing information to improve avocado orchard performance is common from grower to grower.